AN ENTHUSIASTIC coach from Goldsworth Park has been named Surrey FA’s Coach of the Year. Rob Davies, 24, was recognised after three years hard work at Knaphill Athletic, where he coaches the under-12 setup while providing goalkeeping expertise to the club’s senior side. 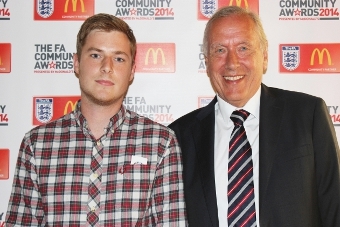 Rob got to meet icon Martin Tyler, one of the most famous voices in sports commentary, at the presentation: a night when more than 100 supporters of Surrey football came out to recognise individuals and clubs for their service and outstanding contribution. Elsewhere on the night AFC Brooklands picked up two prizes – the Charter Standard Development Club of the Year Award, with coach Matt Taylor getting the nod for Young Volunteer of the Year.